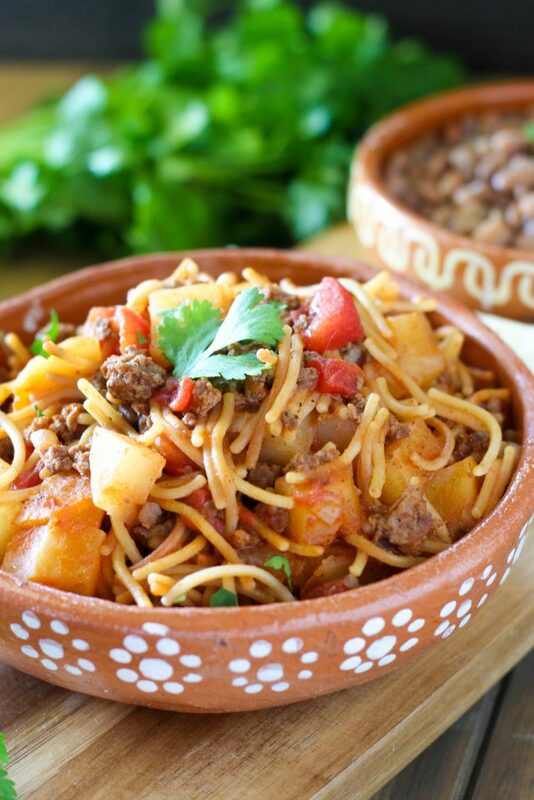 Fideo con Carne and Papas is a traditional Mexican comfort dish that is economical, filling and goes a long way. 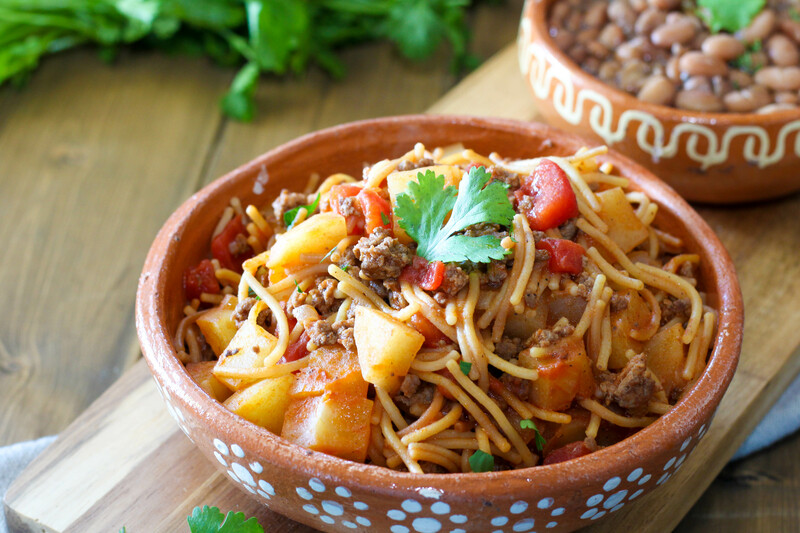 We will get to the Fideo con Carne and Papas recipe soon but be warned – pity party of one about to go down. Y’all. 2018 was hard. It started with me having pneumonia then progressed with my dad being diagnosed with dementia, my mom ended up in the hospital for a week and the guilt of not being able to be with them since then 24/7 was overwhelming. The end of the year had me not being able to be with them as long as I would have liked over the holidays and that sent me into a mild depression. It’s hard coming to terms with aging parents. No one ever told me it would be this hard. Add to that I got sick again just like last year and I couldn’t even take myself to the doctor for fear of being diagnosed with pneumonia again. It was just too much. This blog took the brunt of my being overwhelmed and I just haven’t had the energy, strength or motivation to do anything with it for the past two months. I had to take a break from all things blog related for my own sanity. I’m finally climbing out of my sad hole little by little and last weekend started cooking again. The fact I’m even writing down recipes I want to try is huge. Huge. I made this dish so many times before the holidays last year but I didn’t share it until now because read above. I’m glad it’s my first recipe of the year because it’s one that my mom made often when we were growing up and reminds me of her. I love my momma so much! And I miss her cooking too. I wish I would have gotten all her recipes written down before memory issues started creeping in. 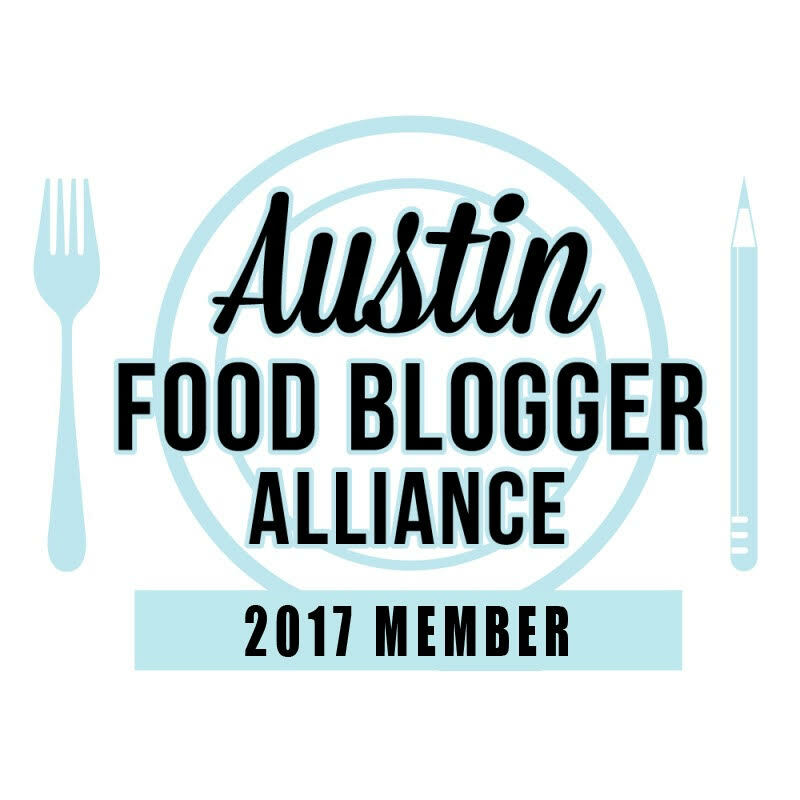 In addition to this blog, I also have a book where I handwrite all my recipes so I can have something to pass on to the kids. This dish is also part of my Pantry Challenge I am working on this year as part of my debt free journey with Dave Ramsey. Oh yeah. Uh huh. I’ve got goals people. 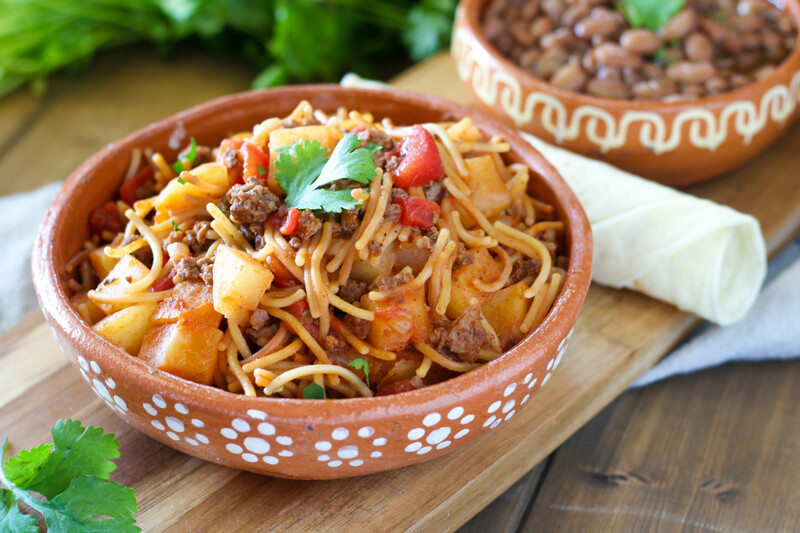 Fideo is one of those dishes that goes a long way and is super inexpensive to make. 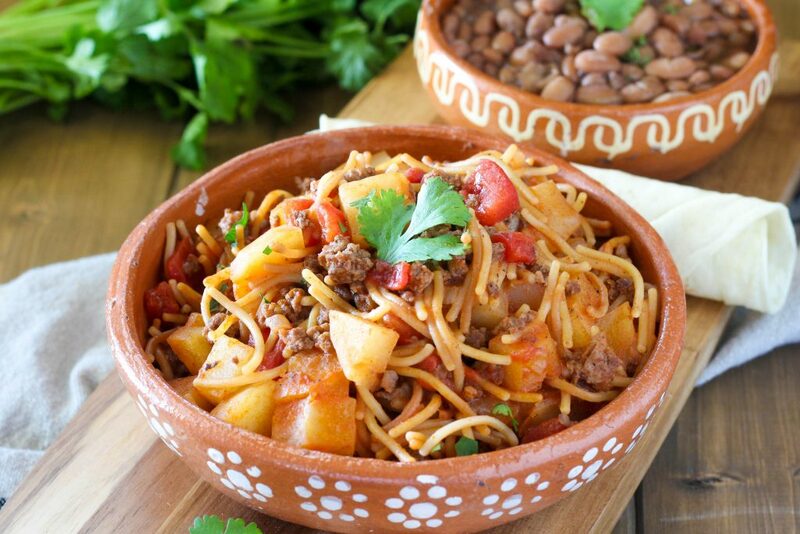 I love the addition of meat and papas with it. And you have to have beans on the side. And heaven help you if you forget the tortillas. Now I’m craving this comfort meal again. Go ahead and dig right in. Over medium heat, add olive oil to a large sauté pan. Add fideo and cook, stirring frequently until browned. Remove noodles and set aside on a paper towel lined plate. Add beef to sauté pan. Season with spices and cook until browned. Add onions and cook for 3 minutes until onions are becoming soft. Add diced potatoes, tomatoes, water and bouillon cute. Cook over medium heat for 15 minutes. Add fideo noodles to pan, stir and add additional water if needed. Cover and cook for 10 minutes until noodles are cooked.